After the success of the Cinema Classics at U.P. Town Center early this January, Ayala Malls Cinemas in partnership with ABS-CBN Film Restorations Group bring another round of spectacular movies from the archives that are now masterfully digitalized for better appreciation in the big screen of today. Ayala Malls Cinemas offer its 2nd Wave of Cinema Classics in Retrospect. Hihintayin Kita Sa Langit is showing at Glorietta & Trinoma Cinemas on March 1-7, 2017. 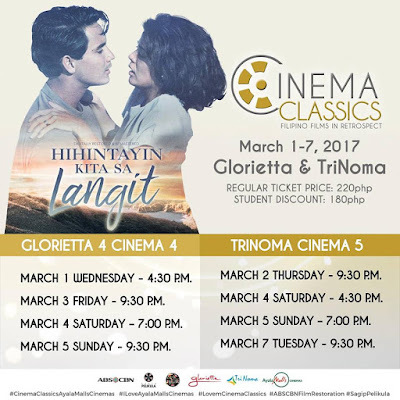 “Cinema Classics is bigger now as we hold it simultaneously at Glorietta and TriNoma to serve our north and south moviegoers. We have more choices with really well-loved films that I’m sure the fans would love again to see in the cinemas. We have One More Chance of John Lloyd Cruz and Bea Alonzo which is celebrating its 10th year this year. We have a Nora Aunor starrer, Tatlong Taon Walang Diyos celebrating its 40th year, with the Superstar’s showbiz anniversary also now at its golden year. And of course, the much-awaited premiere Hihintayin Kita Sa Langit top-billed by the classic Richard Gomez and Dawn Zulueta loveteam. There are really a lot to look forward to” says Amir V. Precilla, General Manager of Ayala Malls Cinemas. Hihintayin Kita Sa Langit directed by Carlos Siguion-Reyna will be premiered at Ayala Malls Cinemas at Glorietta on February 27. A story about Don Joaquin (Jose Mari Avellana) adopts the young orphan Gabriel (Jomari Yllana/Richard Gomez) who grows up in a sprawling hacienda with her daughter Carmina (Guila Alvarez/Dawn Zulueta) and his son Milo (Gio Alvarez/Mark Gil). Carmina loves to fantasize about royalty and being a princess. All is well for Gabriel until the old Don dies and the malevolent son Milo throws Gabriel out of the house to live in the stable as a farm hand. 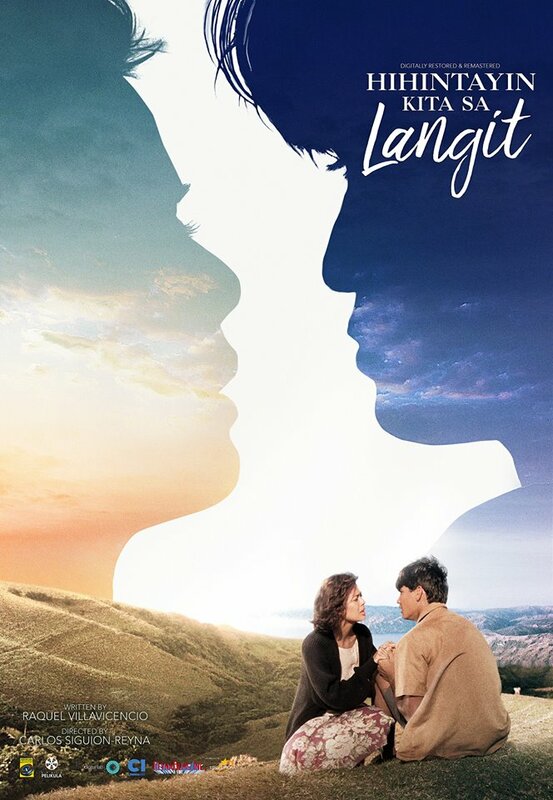 Carmina and Gabriel, being passionately in love, spend all their time together on a promontory near the sea until Carmina meets the rich and prominent Alan Ilustre (Eric Quizon), who dazzles her with expensive gifts and his wealth. Carmina begins to doubt her future with poor Gabriel. Overhearing Carmina's sentiments, Gabriel is heartbroken and goes away to return after a few years with his vengeance. Cinema Classics will also feature films that include from Olivia Lamasan’s Madrasta (1996 - Sharon Cuneta, Christopher De Leon, Zsa Zsa Padilla, Claudine Barretto), Minsan Minahal Kita (2000) (Sharon Cuneta, Richard Gomez, Edu Manzano), Got To Believe (2002 - Rico Yan, Claudine Barretto, Dominic Ochoa) and In My Life (2009 - Vilma Santos, John Lloyd Cruz, Luis Manzano); Laurice Guillen’s Tanging Yaman (2000 - Gloria Romero, Johnny Delgado, Hilda Koronel); Rory Quintos’ Anak (2000 - Vilma Santos, Claudine Barretto); Carlitos Siguion Reyna’s Ang Lalaki Sa Buhay Ni Selya (1998 - Rosanna Roces, Ricky Davao); Marilou Diaz-Abaya’s Karnal (1983 - Charito Solis, Philip Salvador), Peque Gallaga’s Oro Plata Mata (1983 - Liza Lorena, Cherrie Gil, Sandy Andolong); Danny Zialcita’s Nagalit Ang Buwan Sa Haba Ng Gabi (1983 - Dindo Fernando, Gloria Diaz, Eddie Garcia, Laurice Guillen); Jerry Lopez Sineneng’s Labs Kita Okey Ka Lang? (1998 - Marvin Agustin, Jolina Magdangal); Cathy Garcia-Molina’s One More Chance (2007 - John Lloyd Cruz, Bea Alonzo). Get your tickets now at www.sureseats.com. You may also check Ayala Malls Cinemas Facebook page, Twitter @iLoveSureseats and Instagram @iLoveAyalaMallsCinemas for updates.